First of all we suggest that you DON’T switch everything off and lock the door. If you absolutely have to shut down the machine, here are some tips to avoid a disaster when your season starts again. 1. Remove all the plants that you want to live. This is also a good time to do general maintenance. (See our blog posts on this subject here and here). 2. Service your Kuul cell pads by washing and/or ordering replacements if necessary. 3. Attempt to beat the heat by putting on external shade or by closing the internal system. 4. Don’t shut off the fans. Keep them running to pull out heat. NOTE: Excessive heat will/can damage poly lines, warp PVC pipe, pop/crack seals on motors and controllers. Imagine leaving your cell phone in your car for days without leaving any windows open. By the time you get back to it do you think it will function properly? 1. Flush out the irrigation lines, fertilizer injector and evaporative cooling in the winter. 2. Shut off water mains. 3. Keep the heat on to avoid freezing lines and damaging equipment like controllers. 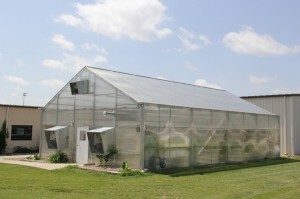 (See our post on Preseason Checks for Greenhouse Heaters). 1. Test/Check and set your alarm system if you won’t be around the greenhouse regularly. NOTE: Installation of a phone line, programming, testing, making sure that the alarm system is fully functioning at all times and for the timely response to an alert is crucial and you could void your warranty if these steps are not followed properly. 2. Remove all chemicals from the greenhouse. 3. Set controls for minimum heat / minimal cooling. We hope you found these tips helpful. If you have additional questions or concerns feel free to reach out to our knowledgeable staff !